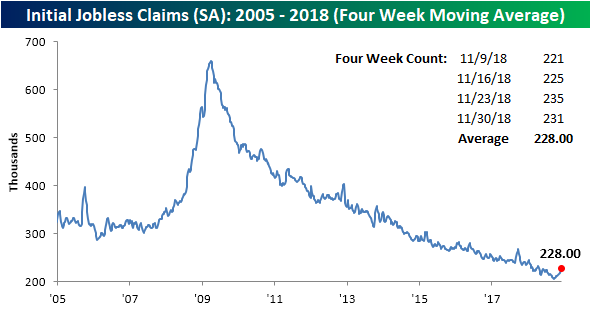 Falling off of their six-month high from last week, this morning’s report on jobless claims showed a decrease from 234K last week to 231K this week. A much stronger decline to 225K had been expected. 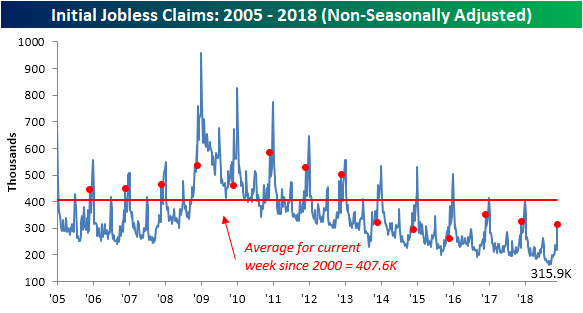 While claims are down for the week, they remain at elevated levels. That is to say, elevated compared to where they have been most of this year. 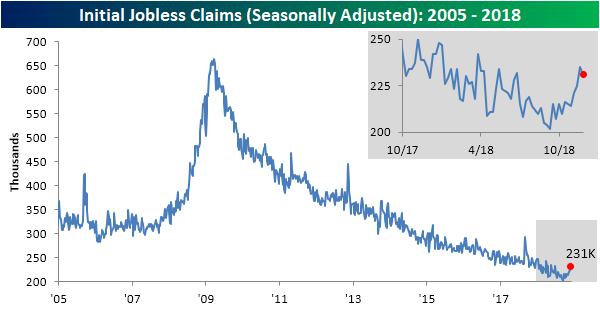 From a broader time horizon, jobless claims have held onto impressive streaks. They have now spent 61 weeks below 250K. That’s the longest since January 1970 when the streak ended at 89 weeks long. It has also now been 196 weeks below 300K. Keep in mind, population and employment have grown dramatically since then, so the current streaks are arguably a lot more impressive. The health of these streaks means that even with the uptick, things are still very good. The four-week moving average has also seen a decent sized uptick this week rising to 228K from 223.25K. That is the highest it has been since April of this year. This week brings the indicator to a streak of 12 weeks since the last time it made a cycle low. On a non-seasonally adjusted basis, claims saw a huge jump to 315.9K but that is due to seasonality. It is still below its level this time last year and the average for the current week since 2000 at 407.6K. This is down from the past couple of years, while 2015 saw a much lower reading for this week. Tomorrow we will see if the recently higher jobless claims numbers are reflected through the Employment Situation Report including the Nonfarm Payrolls number.